My Name Is IRL: What day is it? Did someone forget to get you a calendar for Christmas? No? Well it just goes to show you can't depend on anyone else but yourself these days. 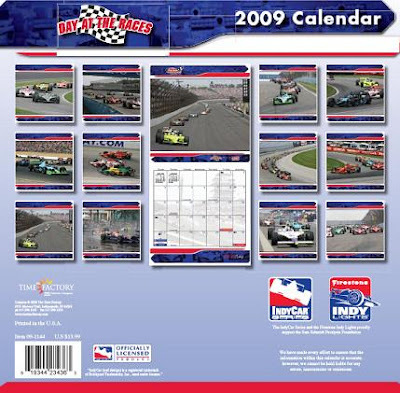 Before you go out and start looking for some new friends, do yourself a favor and buy one of these styling 2009 IndyCar wall calendars first. I've got mine right here *tap tap* and I can see January features a beautiful shot of the excitement that is EJ Viso in a rare moment of driving without aggression. You put this bad boy on the wall and not only will you attract the attention of millions of like-minded open-wheel racing fans, but you will also know EXACTLY what day it is. I tell ya, it's the best entertainment two-fer since Dario and Ashley Judd. Buy one today. In fact, buy two and give one to Scott Speed since none of his stock-car racing "friends" got him one either. I am glad you brought this up. (off season is so boring) Can you name the track in every photo? Did you notice the background photo for Nov is duplicated in Dec? Did you notice the lack of coverage for some popular drivers? RHR gets more pub than both Penskes combined!